For many the word "adventure" as it relates to fly fishing conjures up visions of remote places and exotic species. In truth, most of us will never get on many far off adventures, but is it truly necessary to travel far and wide to experience them? Here’s a 7-minute video trailer that underscores another truth - that adventure is often right under our nose in our own backyard. Check out Fishdog Films Production of The Great Lakes Steelhead Chronicles featuring Jerry Darkes (Patagonia Fly Fishing Sales Rep) and friends. Dream globally, fish locally. Here is little more of dream global, fish local. Here are a couple pics I got from my Canuck buddy, Neil Houlding, who joined us on a float on OH's Grand River late in May. 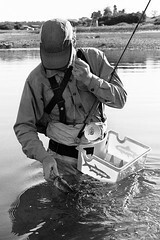 First is Spey guru Will Turek, (in his WM II's) hammering out a long cast with two-hander. Next is Will, me, & the original Fishdog with a nice chromer that crunched a swung streamer. Loving the WM II's & Sunshade Shirt! No, it ain't BC, but it sure is fun. Continuing the theme, the south shore of Lake Erie has been hot throwing flies for smallmouth, white bass, fw drum, and even yellow perch & walleye. Ya gotta love the mixed bag and it's 20 minutes from home and a gallon of gas to get there & back! Fish local- as often as you can! !